We had such a beautiful day today that I just had to start harvesting the tuberous veggies. Harvesting the oca was better than I expected, I was able to find a small tuber or two from about a third of the trial varieties - enough to trial them again next year. A couple showed some promise for a good year, well any year will be better than this one. I also have 8 seedling plants from this season which are almost ready to dig. I hope I never have such a bad year for oca again. I decided that I wanted to grow the mouse melons/Mexican sour gherkins to another bed next year so I started digging the bed they have been in for the past couple of years. Wow, I knew they produced tubers but I thought that as no-one ever talks about them that they were insignificant. I was so wrong. Here are the tubers from a single two (or perhaps three) year old plant. All in all they added up to nearly a kg. I took one in to cook. The skin is not flash so you have to peel them and the flesh tastes kind of like potatoes when raw. 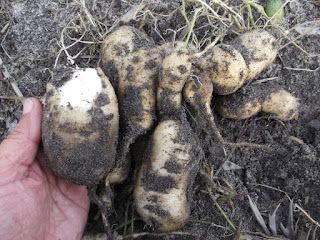 When cooked they are like a mixture of yacon and potato in taste and texture, keeping crisp and juicy even after cooking. They are very bland but take on the flavour of what they are cooked with. They are not something that would take off in a supermarket but interesting and good as a stealth food. And, of course, it means that it is a double use plant. 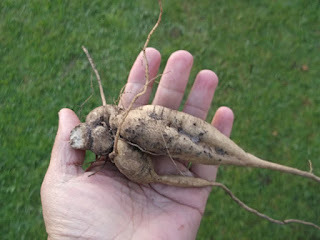 I was getting very impatient to try Mauka (mirabilis expansa) but the frost we had a few nights ago didn't bother it, so I dug up the smallest and weakest plant to try the root. I peeled and boiled it as is usual until tender. I ate it just as it was without any salt or other flavouring and I really love it. It has a taste and texture exactly like potato but a little 'stickier'. I love potato but this is even better. The string in the middle of each root is easy to remove after cooking. I had heard that the cooking water is supposed to make a great drink but it just tasted like potato water to me. To be honest I nearly boiled it dry so maybe the water was a bit too concentrated so I will try again another time.